Several hundred Norwegian Sailors has competed in the America's Cup as crew on American boats that defended the Cup. What historical factors made it possible with so many sailors from that small European country? During their upbringing in coastal Norway in the late 1800's these men became used to the sea during a childhood that involved fishing and lots of activity on the sea since most of the transportation went over the sea. At the age of 14 almost all of them went to sea. They then started working as chefs at the ships that transported fish from the northern parts of Norway to the city of Bergen. The ships had only sails since the engine weren’t common before after 1900. And aboard these ships the seamen learned well how to sail a larger ship during winter and darkness. After some years of work in this type of trade, many of the men went over to work on commercial ships that sailed world wide. And since Norway had a lot of emigration many of these men ended up in USA. 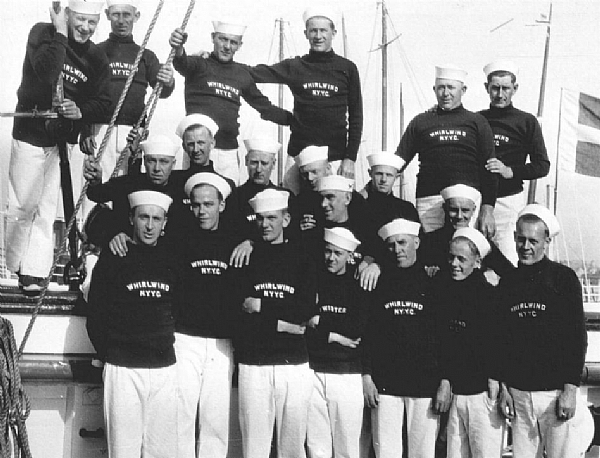 By coincidence some of them were given a chance on a US-sailboat and soon many of them proved to be very talented and advanced to be officers on racing boats. Suddenly practical skills learned in a traditional way became attractive in a new modern context - the America's Cup. For the seamen the purpose of their work changed radically. While they in their youth were sailing to the northern parts of Norway transporting fish to a market they now found themselves sailing regattas for the sport and for the fun for the owners of the yachts. And the yachts they were sailing on were the most advanced sailboats of their time.